Kach and Jon: We’re full-time travel bloggers! Here’s a quick recap on 10 ways to make money from Travel Blogging. I’ll discuss them in more detail as we go after sharing our personal travel blogging story. 10. Exchange Deals – this is not monetary but could be considered as income! For most people, travelling the world is an adventure which involves a lot of saving, followed by the slow yet inevitable draining of your funds, until you’re eventually reduced to the reality of returning home to re-integrate into society, getting back to work, and perhaps dreaming of the next adventure. Not for us. When we started travelling, we knew that there would be no going home, no inevitable return to the office to save for another short-lived adventure. We were searching for a sustainable solution to travelling the world long-term, so saving, volunteering and bar work just didn’t fit the bill – reducing spending was only a temporary solution, we wanted to actually make money from traveling! Some people assume that travel blogging is an easy task. Well, starting a blog is definitely easy, but running it as a business and turning it into source of income is not. Even before we started travel blogging, Jonathan’s aim in life was to find different ways to earn a living while traveling around the world, so we started testing out the different options – from teaching English in Vietnam, volunteering in hostels and restaurants, running a massage business in Peru and finally starting our own travel blog a little over a year ago. We started the blog as part of our quest for a sustainable travel lifestyle. In the beginning we worked between 12 and 16 hours a day for more than 3 months, which gave us a good head start but it wasn’t sustainable or healthy and we certainly don’t recommend it, which is the main reason why we re-branded on making our website a community travel blog with over 20 writers around the world – Here’s how we did it. If you just want to start a travel blog for fun and to share your experiences with your family and friends then I highly suggest that you use the Note platform on Facebook, because there you already have your “Facebook friends” as your audience. But if you plan to start a travel blog as real way to fund your travels or your lifestyle then you have to think about how to treat it like a serious business from the beginning. I’m a very passionate person so whatever I do I have to put my very best into! I’m a very goal-driven and ambitious person, so I always have plans and strategies (my college degree was in Economics and my old profession was in the Quality Assurance field). We started our travel journey in 2013, but only started travel blogging in late 2014 after a lot of persuasion from my family and friends to document our love story and our around the world trip. We didn’t know how to do it but the first thing that came to mind was to inspire my friends who were always complaining about their day jobs and to try to make a living, or at least to experience some discounted Luxury Hotels! We started reading a lot of articles and found that there were many professional travel bloggers earning a good living through full-time blogging. I wanted to be like them so I studied for 2 full months to find out how it all works and how they make money! After about a year of hard work we invested $1000 USD in re-designing our website. Our monthly running costs for the website can be over $1000 (USD), which pays for our domain name and managed hosting, social media advertising, automation tools, content creation for our writers / VA and other maintenance costs just to keep everything running. We didn’t have all the right gear when we started, but we’ve been very lucky and thankful to find some sponsors as well as gifts from family members, but I know that most of professional travel bloggers are investing money to have the latest gadgets to run their websites smoothly (if they couldn’t get it sponsored!). Yes, you need to invest money to earn/make money, perhaps not as much as we do, but we want to go bigger so we have to invest bigger. Please also ask yourself what your strong point is – do you love photography, social media live posting, writing or making videos? You don’t have to do all of it, we don’t! I don’t know how to edit videos so we’ve decided to focus on written content and doing more live streaming (Facebook or Periscope). After a year of travel blogging we’re on our way to reaching our travel goals and fulfilling our tag line “From Monkey Backpackers to Luxury Travelers”, so I’m going to share with you some of the ways that professional travel bloggers make money from Travel Blogging. I have already written Part 1 of this article about how you can Start a Travel Blog. When we first started travel blogging, we were happy enough with getting discounts and eventually complimentary hotel stays from 1 night, up to a week stay. From there, we started to partner with tour companies on an exchange deal basis, with articles being written on our site or on theirs. I think it was beneficial for both parties, we even have messages from partners who told us that we brought them new clients who had read about them in our articles, so we were doing something right! Eventually, we learned that some tourism boards actually give you an allowance for attending the trip, or they can even pay you a daily rate. One of our writers went on a paid press trip in Indonesia and they gave her an $800 USD allowance for the 2-week trip. Now we’re also charging a daily rate when working with tourism boards aside from the cost of the flights, accommodation and excursions. We also have a New York-based Agent now who is helping us to land paid destination marketing projects and other campaign contracts. We know of some bloggers who get paid from $300 – $500 per day just for attending press and fam trips! In exchange for this payment, you’re expected to do a lot of work and of course a report afterwards to show how effective your campaign has been – usually based on social media reports and traffic analytics. When you have an audience and a following, companies will approach you to promote their products and services to them. If those products and services are appropriate to your audience and you would be happy to use them yourself, then you can promote them through sponsored posts, social media campaigns, ad banners on your website and more. While doing any of these just once will earn you a nice payment, it’s far more beneficial to both parties to form a long-term brand partnership, providing greater exposure of their brand and demonstrating a higher level of trust in their products. Of course, this also means that you’re securing a longer term, more reliable income. There are different ways to get sponsored posts, most of the time companies will send you an email to inquire about your rate which is usually between $150 to $800 depending on your Domain Authority (you can read more about Domain Authority here). Some bloggers frown upon other bloggers who are selling text links on their sites, but you just have to be smart and careful about it! You can read the story of our travel blogging friend Johnny Ward, and how he made his first million by doing this through his network of monetized websites – article here. Affiliate Marketing is now one of the main sources of our income from travel blogging. Before blogging, I had always booked my Hotels or flight tickets online and we only discovered this method of earning money last year. Basically, the advertisers will pay you commission when you sell their products through your website – we usually earn from Booking.com, Hostelworld, Agoda and other accommodation companies. They don’t charge extra to people booking through our links, it’s just the same as when you look and book a room from Google or TripAdvisor, they earn commission too! So as long as you are responsible with what you recommend to your readers, then you can feel fine about earning a small reward for doing so! I’d like to thank all of our readers who use our affiliate links to book their accommodation (like our Best Hostels and Best Luxury Hotels lists), as you are helping us to earn a living from the advice we give. We promise we will never recommend something that we wouldn’t use ourselves. I love Facebook and Twitter, but finally we have someone who has taken over our Instagram! As I’ve mentioned earlier, photography is not our strong point, but we’re slowly learning. We know some bloggers who are earning money from Instagram alone by taking over brands’ Instagram accounts or posting advertisers’ photos in their own account. This is more common with fashion and lifestyle bloggers, but lately travel bloggers who have strong following on this platform are starting to earn some decent money too! Instagram Take over – $25 to $ 200 (per photo) depending on your following. Yes, there are times when supportive readers give donations to their favourite travel bloggers! We had an amazing experience when we were building our blog in Costa Rica – we lost our GoPro and at the time it was the only camera we had (it was the early stages and we didn’t have much money at the time). Out of the blue, one reader sent us money by Paypal to buy a new one. I cried with joy for the whole week, I didn’t want to accept it at the beginning but that was a big blessing! I was more motivated to work hard on the blog after that, knowing how supportive people really were. From then we even had random readers who asked us for postcards, then we were surprised to find that they had deposited money in our Paypal account to thank us. Readers have sent me packages of Filipino food seasoning and clothes that I can wear on our travels etc! Really thankful!! Creating content is hard – writing, taking photos and managing social media accounts are all tough, especially when your readers email you and send you unlimited questions on social media. I’m not complaining because they are the reason I do this and I love it! I personally reply to all the messages and emails that I receive everyday, maybe around 50 to 100 people! It takes time, sometimes even up to 6 hours of my day just replying. I’m not discouraging you guys to message us because I feel more motivated reading lovely messages from people supporting our blog but by doing this. So thank you very much to everyone who appreciated all the work, you can still donate so I can buy Nutella (hehehe), feel free to message us to get our details!! We will never change and will try not to let you down as we grow bigger! Here’s are the services we offer and what we charge, we hope to do this more full time as I really enjoy it and I’m really happy seeing that my I’m helping my clients to change their lives! I loved public speaking in high school and college and I thought it would be just the same in the blogging world, but it’s very different! Jonathan and I had our first opportunity to be a panel speaker during the World Tourism Forum in Istanbul, Turkey and we know that experience will open many more doors, which is already happening! We have a lot of plans to do more public speaking, training and coaching in the future. Let us get married first and then we’ll be right on it! We know some Travel Bloggers turned public Speakers who are earning more than $2000 per event as well as their travel costs. We’ll make it there! Running a travel blog while traveling full time is really tiring so I haven’t been able to finish the books that I’ve been intending to write since last year, but finally I will be releasing my 3 e-books this summer! As much as I want to give them away for free, these are the products that we have worked hard on since last year and spent a lot of time researching and writing for our targeted audience! Our content on the website is 100% free, we even give away freebies and trips to our readers, but now I will be releasing something that I created from scratch and will be charging for it. So I hope you guys will support me on this one! Some people think that we actually don’t need to earn money because we’re already traveling the world, which is often mistaken for being rich and having a “hidden pot of gold” somewhere.Especially when they see us staying in 5 star luxury hotels! Well, we understand the confusion and where this misconception comes from, but the simple truth is that we aren’t actually paying for those hotels, they are provided free of charge! This is how we do it – we often make an EXCHANGE DEAL agreement with brands like hotels, tour agencies and other travel companies which are perfect for our audience, or a part of our audience. In exchange for a free stay, or tour, we provide exposure of their brand through our social media and our website. Remember, there’s no such thing as free! If you’re a travel blogger and want to learn how to pitch and get sponsored stays or trips, I can also help you with that with a 2-hour blogging coaching session so feel free to email me! 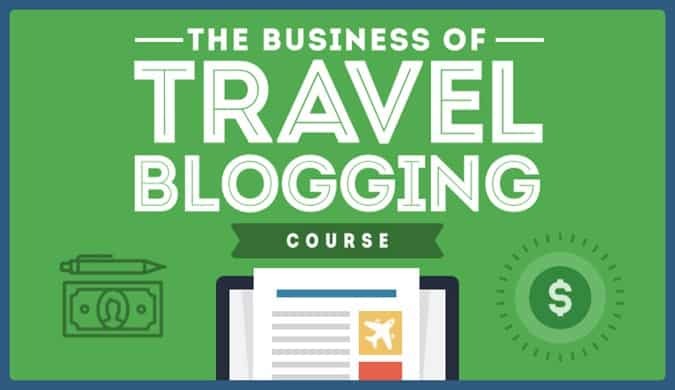 If you still want more expert help from the best, then you should check out either of these two blogging courses: Nomadic Matt’s The Business of Travel Blogging, or Travel Blog Success which Jonathan and I are members of. We’re not yet earning the same combined amount of what we were earning while I was still working for an oil company in Iraq and Jonathan as an Architectural Technologist in the UK, but I know that all of the effort and money we invested in building this will reward us eventually! One day it will become our passive income while we’re busy building our Yoga Spa Resort and raising our cute little monkeys! Disclosure: Please note that some of the links above are affiliate links. So when you make a purchase we sometimes make a small commission, at no extra cost to you. The cost to you remains the same, sometimes even cheaper if we have negotiated a special deal for our readers. You guys are an inspiration! I’m a newbie travel blogger so reading posts like this are very inspiring to me! Although public relations is my background, I still have a long ways to go and a lot to learn! I’m currently teaching in South Korea and have blogging as a hobby. But I’m seriously considering making it a full time gig after being abroad and moving on to my next adventure! This is an awesome post! I have recently started my blog and has not thought about monetizing it at this moment. but definitely would want to do it when the blog is ready. Would keep this post in mind. Congratulations for your successful blogging experience! There’s a lot of work behind it, you can be proud of that! I love how detailed this post and how open you guys are about sharing your journey. That is a rare thing in the travel blogging world as you might know. Kudos to you for being so large-hearted! Amazing article with so many different ways to monetize a travel blog. I think I have to try some of it. I’m going to share this with my friend as she has just started sharing her travels on Insta and Youtube so maybe this is something she can consider for the future!! This is a very informative post. Thanks for sharing all these info. It will help a lot of travel bloggers and other bloggers too. Great article in this increasingly competitive (super-competitive) field. Hopefully there is room for more people but if not, it will just spur more innovation!